Are you finished with all your holiday shopping? Do you still need to buy a gift for someone and have no idea what to get? We have teamed up with some fellow bloggers to provide you with fantastic gift ideas for pretty much everyone on your list. If you want to give a Jewish friend something for the holidays, if your family celebrates Christmas, and your child's best friend is Jewish, or you work with someone who's Jewish, what should you get them? 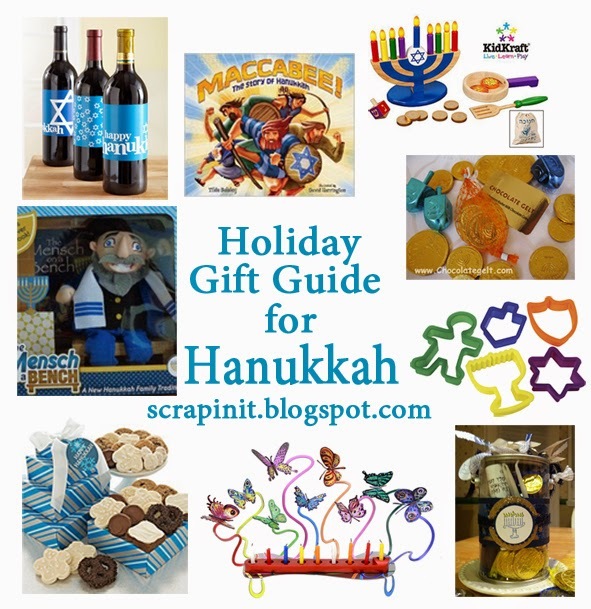 Here's the ultimate guide for Hanukkah gift giving! 1. Hanukkah is not the Jewish Christmas: First of all, it's important to know that Hanukkah is not a "Jewish Christmas". It’s a Jewish holiday that is much less important in Jewish religious terms than Christmas is to Christians. However in the United States especially, Hanukkah has taken on a gift-giving dimension because it just happens to be in the month of December, during the Christmas season. 2. Do give: books, clothes, toys, electronics, equipment, alcohol beverages, jewelry, trips, cash, and gifts of time such as free babysitting or a work shift, or donations to charity. 3. DON’T give a Hanukkah gift with a pattern of Christmas trees or Santa or pass on clothes with red and Green colors. Christmas colors are red and green. Hanukkah colors are blue and white. 4. Give It During the Holiday: Try to give it in a timely fashion, meaning during Hanukkah. This year Hanukkah is December 16th until December 24th 2014. 5. Rely on Traditional Hanukkah Gifts: If you're Uncertain, it’s always a safe bet to give something traditional. 6. DON’T Wrap a Hanukkah Gift in Christmas wrapping: Avoid wrapping a Hanukkah gift in Christmas wrapping paper; if you buy wrapping paper, select a generic pattern or special Hanukkah wrapping. 7. Buy or make a Hanukkah card: Don't put a Christmas card on your Hanukkah gif. Make a combo of Christmas-Hanukkah gift wrap for mixed-faith families. 8. If you're invited to a Hanukkah dinner try to familiarize yourself with the holiday basics: During Hanukkah a candle is lighted in the Menorah each evening through the eight days of Hanukkah as a blessing is recited. Each day a candle is added until in the 8th night of Hanukkah all eight candles are lit. Traditional foods include potato latkes, applesauce and brisket. Spinning the dreidel (a four-sided top) for "Hanukkah gelt" (gold-wrapped chocolate coins) is another part of the celebration. * Don't ask the hosts or their children if they wish they could have a Hanukkah bush or stockings. * Don't blow out the candles. * Don't fuss about how latkes don't fit into your diet. 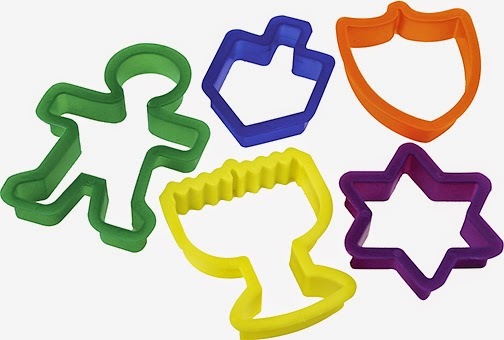 In honor of eight nights of Hanukkah here are 8 Hanukkah gift ideas. Every holiday has special foods that are traditional. For Chanukah, latkes (potato pancakes with applesauce and sour cream) are a must. Fresh fruit baskets, fancy mixed nuts, dried fruits or sweets are good suggestion but the best idea (at least for me) is a cookie gift. Cheryl's Cookies has Hanukkah cookies you can buy packaged in a lovely blue and white holiday boxes. Also consider giving a dozen doughnuts, especially jelly doughnuts, since an Israeli custom of having them for Hanukkah has caught on in the U.S. in the past decade or so. 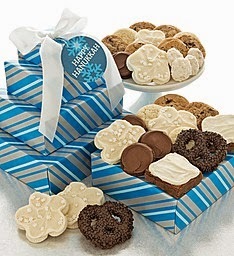 Remember before giving cookies, or any food gift, make sure that the recipient doesn’t keep Kosher. If keeping Kosher is the challenge, Harry and David has some kosher gift baskets that anyone would enjoy. For children, the equivalent of Christmas stocking-stuffers are a dreidel (a special toy top with Hebrew letters on each side), or Hanukkah Gelt - little bags of chocolate wrapped in gold paper to look like coins. HanukkahGelt.com has great deals for both chocolate and dreidles. Kids can spend hours of fun doing crafts. The Craft Shop has many Hanukkah craft options. The KidKraft Wooden Chanukah Set is another option to consider. Seems that for about every occasion of Jewish gift giving, books come in as the number one choice. For children, there are a number of Chanukah books that can be selected by age appropriateness or family situation. * Happy Hanukkah, Curious George tabbed board book by by H. A. Rey and Margret Rey. 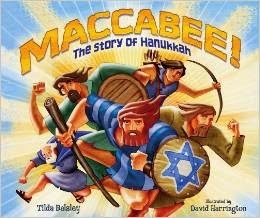 * Maccabee! : The Story of Hanukkah by Tilda Balsley * Elmo's Little Dreidel by Naomi Kleinberg * I Know an Old Lady Who Swallowed a Dreidel by Caryn Yacowitz. For adults and kids alike the Hanukkah popup book, Chanukah Lights is a great gift. It is a spectacular book and a work of art, as many popup books can be. Children will be fascinated by each scene, which appears magically as the pages are turned and adults will appreciate the artistic renderings and paper engineering. If you are not certain what books the person has read or not, or their specific taste in books, give an Amazon, Kindle or Nook gift card. 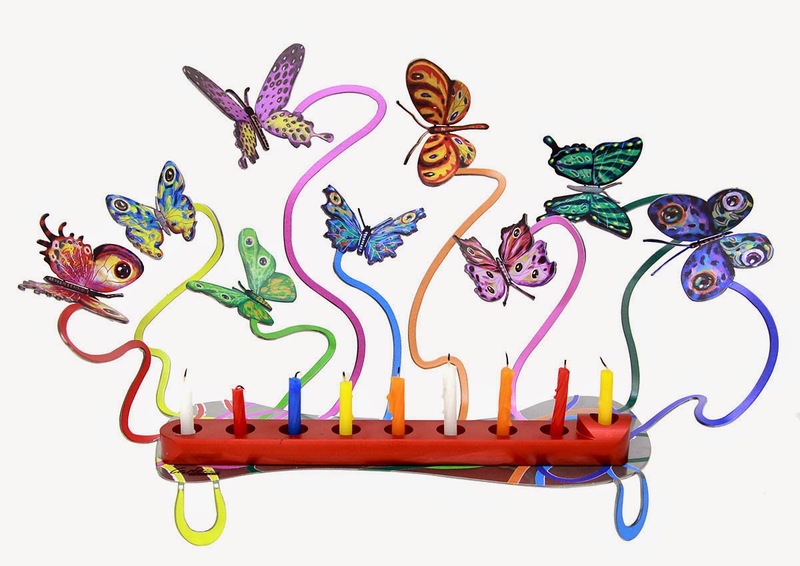 Chanukah is the festival of lights, so what better gift to give than candles and Menorahs, the candelabra for Chanukah. In order for it to be true to the holiday, it should have 8 places for the candles to fit, along with a ninth space for the Shamas or candle for the sole purpose of lighting the other eight candles. Anything less is not a true Menorah. There is a huge selection on JudaicaWebStore.com ranging from traditional style to artistic and modern. “Deeds of giving are the very foundations of the world” (Jewish saying) In the Jewish religion philanthropy is an obligation. One should never turn away from someone in need. So, giving a donation on someone’s behalf is considered a “Mitzvah” or good deed. It doesn't matter if the charity is specific for Jewish people as long as it's an organization that is supported by the recipient. Getting a card with the donation written on it will make anyone mushy. For all you crafters out there who are looking for handmade gift ideas here are a few easy, fun and beautiful projects. Hanukkah in a jar is a practical gift. Just fill a mason jar or any plastic jar and fill it with candles, gold chocolate coins and a dreidel. Embellish it with white and blue ribbons, glitter and card. Alcohol is a great gift for every holiday. 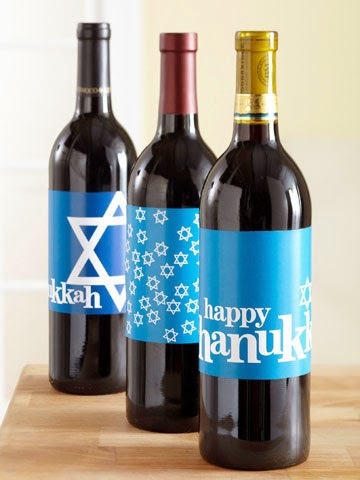 Decorated wine bottles with printed Hanukkah labels will make everyone happy! One of Hanukkah's fun traditions is the dreidel game. It will become a wonderful gift for kids when it's presented inside a cloth sack customized with the rules. Fill bag with a dreidel and counters (you can use coins, candies, or buttons). In Jewish tradition being happy and laugh during the holiday is a must, so what better way than to give a funny humorous gift. The best gifts are those with a little self humor…The Schlep bag is a joke about the Yiddish word that means carry with while complaining. 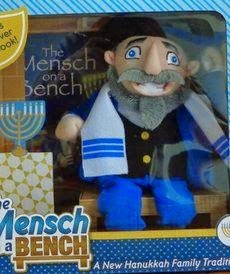 The Mench on a Bench is the Elf on a shelf's Jewish counterpart and Oy to the world cd is a funny music cd. 8. Let them buy their own gift! If you have no idea what to buy there is always the option of a gift card. This way the recipient can buy themselves whatever they want and everybody's happy! Don't miss the giveaway! Be sure to enter here for a chance to win a Target gift card! 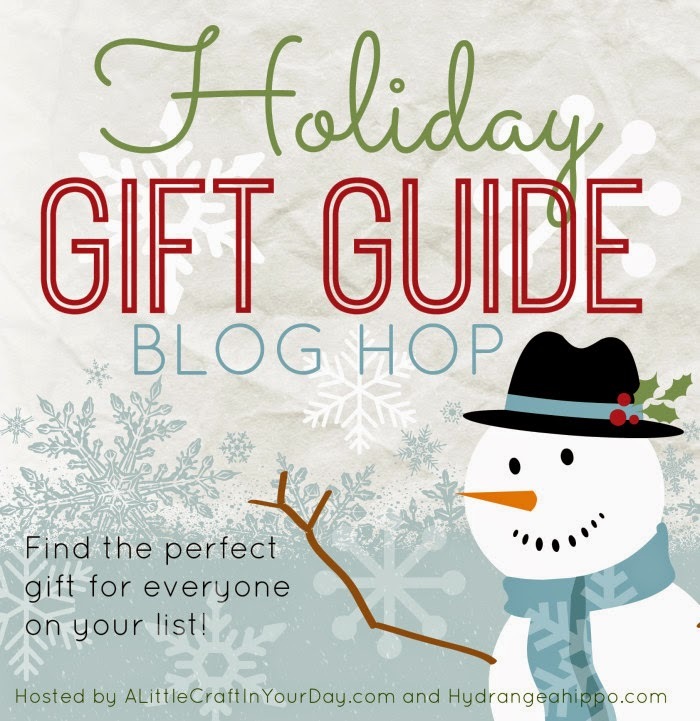 And don't forget to checkout all the gift guides below!